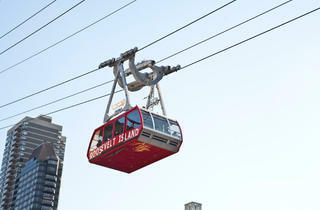 Tram runs Sun–Thurs 6am–2am; Fri, Sat 6am–3:30am. $2.75 per tram ride via MetroCard. 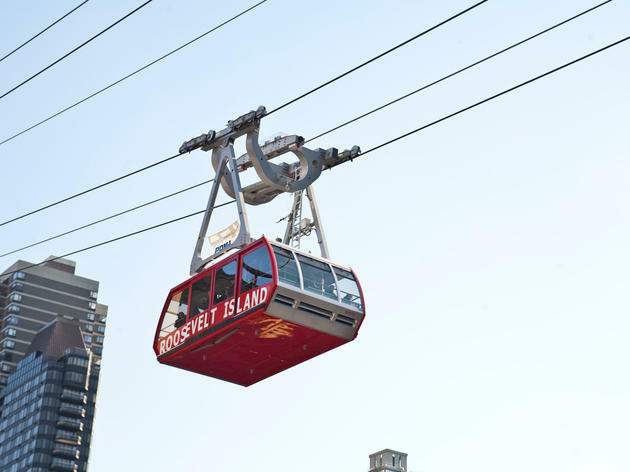 You can use the cable car for the price of a subway ticket. It's funny to be over the road and near the bridge. Unfortunately it's not the best view of the city, because you do not see famous buildings. Also on the other side of the water, you arrive on a small island that isn't really interesting. I think this is rather a transportation for new yorkers. With just a swipe of a metro card you get to ride a tram way across a river and take in all the views of NYC that you can. I recommend standing toward the side that's opposite the bridge as you don't get to see much since the bridge is blocking and the front and back views aren't that great. I would say this is a local's secret, thank goodness the tourists don't use it too much otherwise it'd probably be 5 dollars or more to ride this! I've passed the Roosevelt Island stop so many times on the subway and never thought to stop by until discovering that it's the place that the tram goes to and from. The tram looked super cool, so I decided to check it out, and explore the island while I was at it. I was surprised to discover that people actually lived here! It is a largely residential area with a few restaurants and stores. There's a free shuttle bus that takes you around the island, but the island is not that big and can be navigated easily by foot. I've never seen a lighthouse in person, so being up close and personal was pretty cool. Otherwise, there's not much to do. If you're looking for more activities and more of a view, I'd head over to Governor's Island. But, the tram is reason enough to make a trip. Roosevelt Island, located between Queens and Manhattan, but considered Manhattan, is a interesting location. You can get there via car or subway, but the best way is via the tram. This goes from Manhattan at 60th Street and hovers over the East River next to the 59th Street Bridge. Views are incredible, day or night. Once on the island, there is about a block of retail stores and restaurants. That's it. The island is mostly residential. You can bike around the entire island or check out the far south end that has been remodeled recently. The remodel highlights FDR, who the island is named for. You can also see the old "Small Pox Hospital", better known as the location where Spiderman and Green Goblin fought. The lighthouse on the far north end has an interesting history as well. Good for a day trip. Not gonna lie, I went to Roosevelt Island just to take the tram and pretend i was in "Spiderman." It costs a subway fare, you get an alright view of Midtown East going from the island to Manhattan. Worth it for a true NYC experience! Great place to visit.Although there is not much to do in Roosevelt Island getting there is half the fun!You take a tram that goes over the bridge (only takes a metro card swipe $2.75), it is kind of scary but at the same time pretty cool to go over the water.Once you arrive at the island, there is a “free” shuttle bus (you can give a small donation to ride) that takes you to the light house at the tip of the island.You obviously cant go inside but you can get the skyline of the city and its fun and relaxing.